I started my last week of class today. It’s Immersion Level V. Different teacher, different classmates. Different ballgame, in fact. Why? Well, here’s the deal. There are two other people in the class — one is Fedelique, a French woman who has been in Greece for thirty years. Thirty, as in 3-0. Her Greek is already nearly flawless. Why is she taking the class? 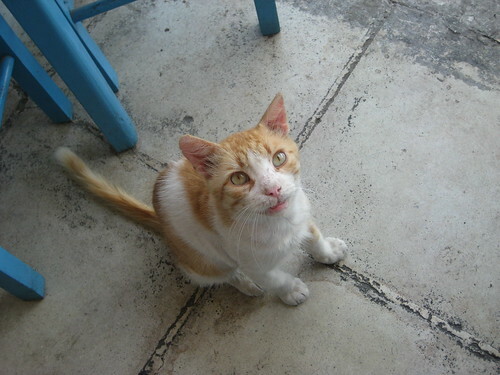 Because she’s spent much of that time in the country, and she wants to sound more like an Athenian. The other person in the class is Irini, a young Greek American woman (who, incidentally, just graduated from IU and was also a student of Frank Hess’ during her time there) who, you guessed it, has grown up hearing it all of her life, speaks it nearly flawlessly, and is mostly here killing time before she starts law school at University of Chicago. Dimitra, the teacher, is a native speaker, φυσικά. Oh yeah, I’m there too. At the break, Dimitra asked me, “Is this going to be okay for you?” She asked this because all three of them were speaking so quickly in class that I clearly had major comprehension difficulties. Even simple sentences I couldn’t follow because of how words were running together; even when they slowed down, words were compressed together in a way that I couldn’t even break out the individual words properly the way they were talking, let alone parse them correctly. I explained. I had a good chunk of Ancient Greek before I started Modern Greek; this gave me enough of a grammatical foundation for Modern Greek that Frank thought it appropriate to bump me from first semester to fourth semester; this had the benefit of keeping me from being bored out of my mind for three semesters, and keeping up with the grammar was no problem, but the university classes unfortunately did nothing for my listening ability. In first semester, people spoke slowly and made a lot of mistakes; in the fourth semester, they were speaking really fast but still making the same mistakes. My ear had nothing to latch onto, and when Frank spoke I didn’t have any idea what to listen for, because while he was speaking correctly, he was also speaking quickly. So, I’ve been hearing it spoken for less than a year, and mostly by non-native speakers. Reading comprehension isn’t a problem, grasp of grammatical concepts isn’t a problem, I just need everything repeated five times in order for me to get half of it. Then there was the guy who played a song for me and said, “It’s in Greek. Listen and see if you can understand.” The first line of the song wasn’t even over when he just started translating, making it impossible for me to hear the Greek words at all. The other frustrating part is that there are times when I get hung up on a particular part of something somebody says, and I’m trying to parse it in my head, and the other person just assumes I didn’t understand any part of it and repeats the whole thing in English. Or, perhaps the person repeats in Greek, explaining the meaning of every Greek word in English as they go. “Yeah, that’s very common,” Dimitra said, nodding. It’s difficult because I could really slow down the flow of the class for the other two, but grammatically it’s the most appropriate section for me to be in. She’s not sure what to tell me except that when I don’t understand something, I need to insist on having it explained, and that she’ll give me as much advance warning on readings and whatnot as she can so that I have time to prepare. The bottom line is that I’m only there for the first week, so it won’t be too disruptive. It’ll be a good closing windsprint for me, I suppose, then I’ll be gone and they can do what they need to do. The part that I wonder about is this. Since I was thirteen or so, my musical tastes have, in one form or another, included material to which I cannot listen for content. Cocteau Twins was the first dip of the toe into this kind of thing; that plus the years and years I listened to opera (to say nothing of sacred music) before I was ever able to study the languages meant that I had to ignore the meanings of words and simply listen to sounds. This means I have spent God only knows how many hours over the last twenty years or so with that part of my brain deliberately disengaged when I listen to a large chunk of my music collection. Might this be an issue? I really don’t know — I want to say I didn’t exactly have this problem with German, French, or Italian, but I also never tried to do quite as much with those three. Maybe the bottom line is just this — a lot’s been crammed into my head in the last year and it needs time to settle and take root. I am, to be sure, hearing better now than I was six weeks ago, it’s just not as dramatic of an improvement as I would have liked. As well, in the last class and in this class, I’ve started to get used to new words being explained to me in Greek, and Anna, the teacher from levels III and IV, said that she thought I was probably ready to start using a Greek-Greek dictionary. That’ll help with vocabulary, sure — but I’m not sure what it will do for my listening comprehension. Guess it’ll be interesting to see how the week goes. When you buy tickets online to go to an island, you’re e-mailed a confirmation number. This is not a ticket, as the e-mail rather forcefully reminds you; you have to redeem the confirmation number for your ticket at the boating line’s office no later than an hour and a half before the boat pushes off. As my boat was leaving at 8:50am, this meant needing to pick up my ticket no later than 7:20am; furthermore, this meant needing to be at the Ethniki Amyna metro station by roughly 6:30am, which, the 404 bus being what it is on the weekends, meant waiting for it starting around 6am, which meant being up by 5-5:30am. 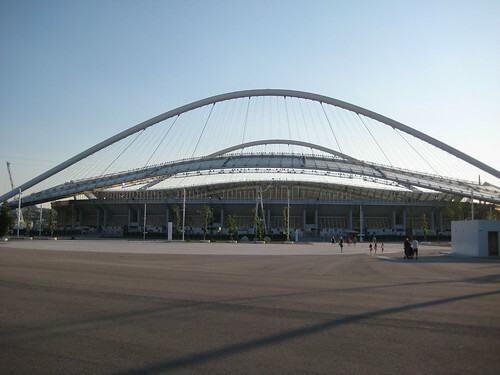 So anyway, last Saturday I stumbled, still half-asleep, out of the Piraeus train station at a little past 7am. To say the least, it was a bit of a zoo; this is the time of year when everybody in Athens flees for the islands. Hellenic Seaways was where I needed to pick up my ticket, and I realized I didn’t know where that was. 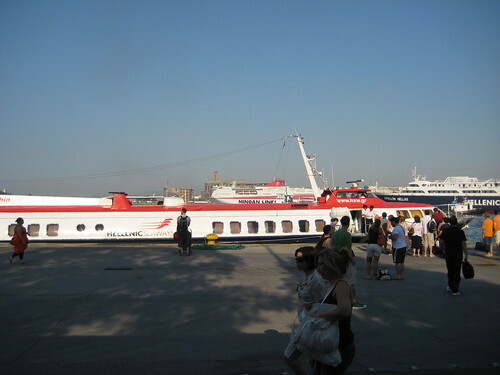 I headed for the nearest big sign that said “Hellenic Seaways,” which actually led me into the office of a travel line bearing a different name. “Here,” they told me, and gave me my ticket. Um, okay. Now, your ticket bears a gate number and the name of your boat. You would think, as I did, going off of the system in use in most airports, that gate numbers would be unique to individual boats. So, I merrily headed for gate E-8, thinking it would be obvious as soon as I got there where I needed to go. So, the reality is, there are something like 10-20 boats per gate. It is good that I realized this, because I was sitting at a café being robbed blind sipping a mediocre at best double espresso for which I had paid 5 Euros at gate E-8 (word to the wise: don’t bother with the gate café, just get something at one of the many other cafés around the harbor) until 8:30, wondering why the heck I wasn’t seeing the 8:50 boat for Aegina anywhere. I realized, getting up and looking around some, that gate E-8 stretched quite far away from where I was sitting. Jogging over to the far side of gate E-8, there were multiple signs, kiosks, and offices telling me I was in Hellenic Seaways country, and while it hadn’t arrived yet, they showed the Flying Dolphin XV as being on their schedule to depart for Aegina at 8:50. It arrived shortly thereafter, and off we went. It’s only about 40 minutes there (Aegina is the closest island to Athens, I believe) — no time at all. 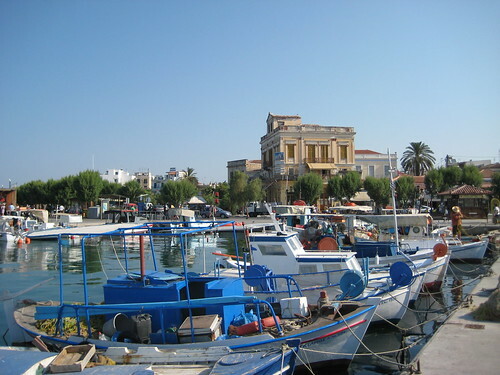 The marina in the town of Aegina is very charming; pistachio nut stands are everywhere (these evidently being one of the island’s big exports), there is no shortage of restaurants and cafés on the water, and plenty of bakeries and shops and so on and so forth. 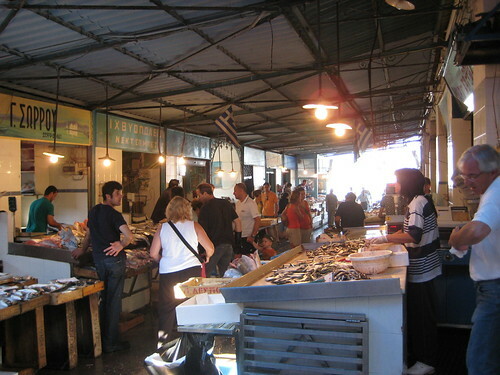 I’ve mentioned before, I think, that Greeks are excellent at the hard sell; there were a couple of examples of that in particular I ran into on Aegina. One involved me going into a bakery where they had nothing posted on any of the pastries to tell you what they were; I would ask what a certain item was, and the game the person behind the counter played was that he would tell me, I repeated to make sure I understood, and he would take that as an order. It took me a tiropita and a zambontiropita before I realized what he was doing, at which point I stopped asking. Well, okay, to be honest, there was another factor at work here that I may have misunderstood, but I really don’t think so. I’ll explain what I mean in another post. The other example I’ll get to shortly. 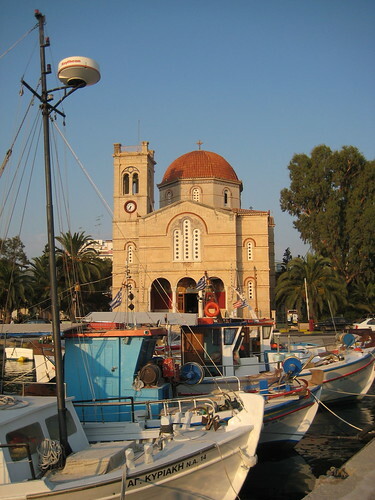 There’s also a beautiful church along the water, the Cathedral of the Dormition (also called Panagitsa). It evidently dates from 1806; one very distinctive characteristic of this church is that, in addition to the 2+ centuries of incense permeating the walls, there is a very strong smell of honey as you walk in from the beeswax candles. Like many churches here, there is an ambo, but curiously enough they have removed the steps leading up to it, leaving only the pulpit portion in what is a clear state of disuse. I walked around the harbor for a good couple of hours, simply taking things in (and unsuccessfully trying to engage an old man in a backgammon game). At that point, it seemed like a good plan to try to find St. Nectarios. 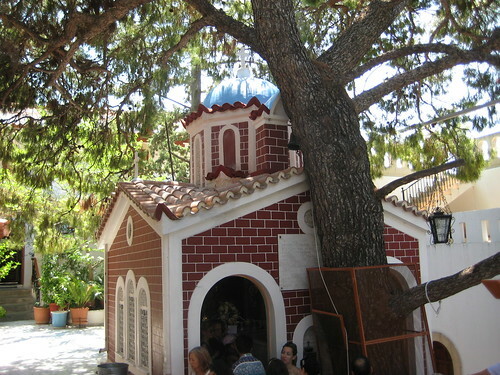 By the way, it is difficult to overstate the level of local devotion there is to St. Nectarios on Aegina; he is everywhere. Icons of him, to say nothing of other memorabilia, are in virtually every shop (as well as prominently displayed in the churches). 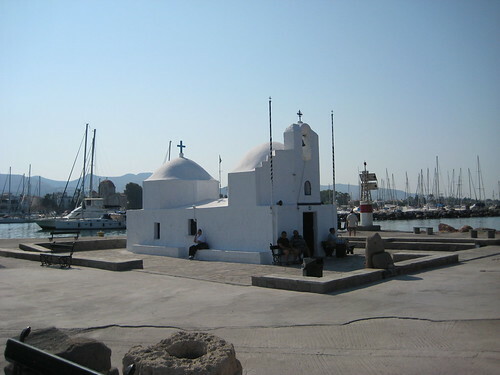 The island of Aegina is very insistent that you know that it is St. Nectarios’ home. But you don’t know the half of it until you see the monastery. I had originally looked at a map of the island and thought to myself, “Oh, the island isn’t all that wide; I can probably walk it.” It is an extremely good thing that I disposed of that folly and got on a bus. It was hot, it’s a lot farther than it looks, and the terrain is not exactly even. As it was, the bus was almost too hot. And then you’re thinking to yourself, Oh. Well, that was easy, wasn’t it? You can go to my Flickr page and peruse the pictures all you want; one of the main things I want to point out is that they’ve built two levels of galleries in the church, and the church is already freaking huge — as in, bigger than Holy Trinity in Indianapolis huge. 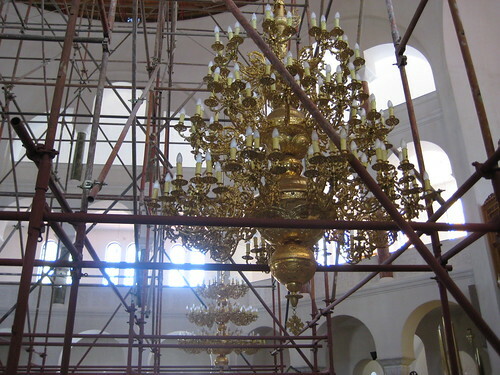 This suggests that on 9 November, St. Nectarios’ feast day, they expect it to be packed to the rafters. The other thing I want to point about the interior has to do with the chapel off to the south end of the nave, where some of the relics are. Particularly, the iconography — for example, here at the dome of the apse in the chapel (and I would look at the pictures of other frescoes in the chapel, too — time and space simply do not allow for a full discussion here). Does that look familiar? It should. The point is, here’s a holy man who died less than a century ago — for all I know, there is still a living memory of him somewhere. Despite being contemporary, he is still “discussed” iconographically in the same language as saints of antiquity. I suppose what I’m getting at is something I’ve said before — saints do not belong to a fixed time period. Someone is, or able to be, no more or less holy based on when they lived. In fact, we desperately need contemporary saints and to have such people in living memory presented to us in this way. It is one of the ways we are reminded of how to be Christlike, to have these models of holiness in our midst and thought of us as in continuity with (or in the tradition of, if you prefer) all of our other saints. It tells us that miracles still happen, that the Holy Spirit still moves among us, that Christ is still in our midst. Our saints need not, in fact must not, be limited to accounts from antiquity which we’re starting to talk ourselves out of believing. And local veneration is incredibly powerful — to look at an icon and to realize, “Hey, I’m standing right where that happened and where those people lived and breathed and did what they did,” is humbling beyond belief. Speaking of humbling beyond belief, I will now tell you of the second hard sell I encountered. 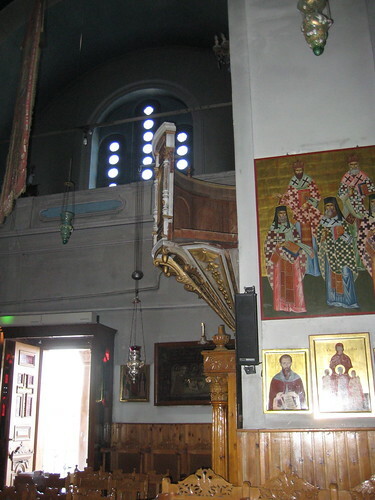 Only about half of the monastery proper is open to the public; this includes two (much) smaller churches, the chapel where St. Nectarios’ body is , two bookstores, and then his cell is open as an exhibit. 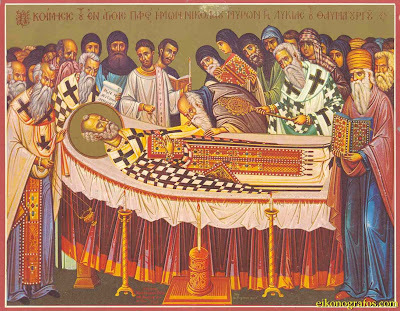 The main thing I want to talk about here is seeing the veneration of his body, and (to some extent) participating in it myself; this is something that up to this point was rather foreign to me as an Orthodox Christian in the United States, given that, of the three analogous examples I can think of, only two are actual glorified saints (Ss. Herman of Alaska and John Maximovitch) and all are in California or Alaska (the third is Fr. Seraphim Rose), meaning that they’re rather remote for somebody whose Orthodox Christian life has been spent in the Midwest thus far. People knelt and prayed at the casket which held his bones; I saw pilgrims weeping; and strangest of all, I saw people pressing their ears to the reliquary, as though they were listening for some sound from within. I really didn’t know exactly where to put myself in all of this, to be honest; I lit a candle, and I prayed at the reliquary, but my emotional response wasn’t quite that demonstrative — which isn’t to say that I didn’t have one, I did, it was just rather internalized — and since I didn’t know what was going on with the listening thing, I didn’t do it. I went into the bookstore and asked the woman behind the counter, “I’m Orthodox, but I’m American, and I’ve never seen anything like this before. 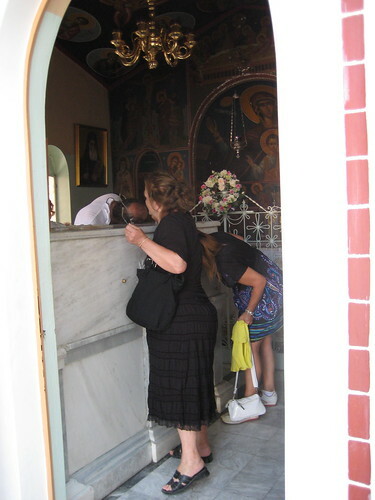 Why do people listen at the body?” She wasn’t sure how to answer; she said that it was a way of honoring St. Nectarios with another sense, but she couldn’t quite articulate exactly how. 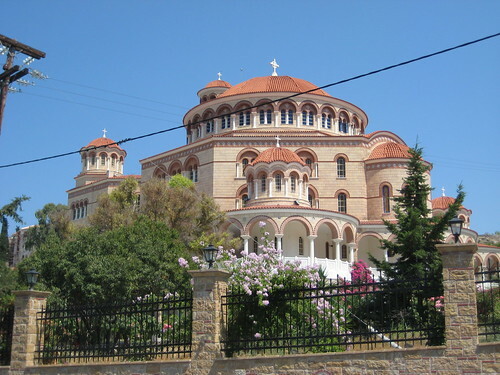 All told, I spent about four hours at the monastery; I had originally hoped to be able to stay for Vespers, but my boat back to Athens was leaving at 8pm, and the bus schedule didn’t quite line up to make things work. That’s okay; as I’ve had to tell myself a number of times, this won’t be the only time I come to this part of the world. Let’s say that there was a lot about the monastery that was spiritually overwhelming, even if I didn’t necessarily understand everything I saw. Part of why I spent so much time there is that I kept returning to the body and to the other reliquaries — there was something pulling me back to them, something that I was supposed to learn from being there. I’m still figuring out exactly what that is. 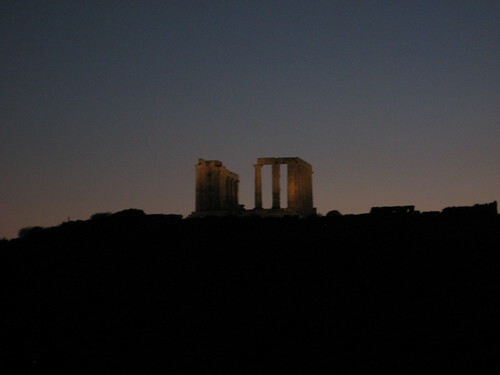 From the monastery, I took the bus to to the Temple of Aphaia which, as I noted earlier, is said to form an equilateral triangle with the Parthenon in Athens and the Temple of Poseidon at Sounio. There really is something very cool about being able to walk around structures from antiquity like this; that said, I think I would have rather come here first and then gone to the monastery. My head was simply too occupied by what I had witnessed there to really be able to appreciate what all I was seeing at the ruin. 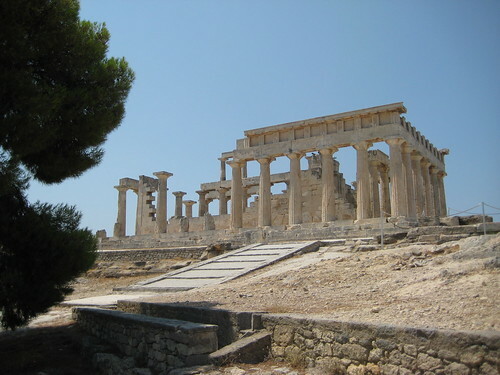 The Temple of Aphaia is certainly fascinating intellectually, but I was very much someplace else spiritually, so it left me a little cold. Even if that was the case, however, I have to say that there were some really beautiful views from the top of the hill. It is nice being someplace where one can see water and hills and mountains, I can’t deny that. Something that was really bizarre: there was a father and son walking around the ruin, and I heard them speaking German. I addressed them in German, and we talked a bit. They were just in Greece for the weekend(! ), and I found out that the boy would be going to high school in Boston. No, that’s not the weird part. The weird part was that I started sentences in German but kept finishing them in Greek. My mouth really, really, really wanted to default to Greek, and I had very real trouble staying in German. I kept having to apologize — luckily, they just laughed and took it in stride. Anyway — I didn’t spent four hours at the Temple. More like one and a half. 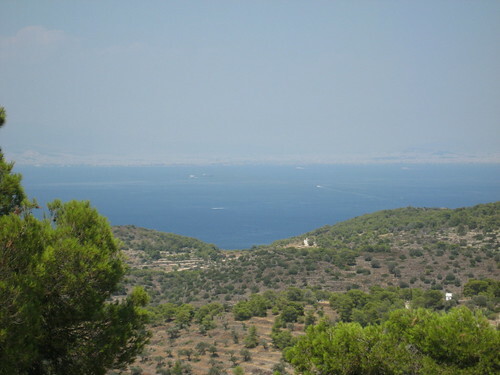 I tried to go to Vespers at Panagitsa before taking the boat back to Athens, but as it started at 7pm and was combined with 9th Hour, so I had to duck out at 7:30, when they had just begun “Lord I have cried…” Alas. On the boat back to Athens, I became aware that the young (mid-20s, maybe) couple sitting next to me was American. Their names were Erin and Jeremy. We got to talking, and it turned out that they were Pentecostals of the Assemblies of God variety. Erin has been working for some time in the Dominican Republic for a ministry that deals with troubled youth called New Horizons; “If you’ve heard of us, it’s probably from bad publicity,” she said. “We get that a lot.” Well, there came a point in the conversation where I was asked point blank what I was, and I was obliged to tell them I was Orthodox (“Greek Orthodox,” I said, for purposes of convenience) — not that I had been hiding it, mind you. I brought up the St. Innocent Academy after she talked about New Horizons, for example. “That’s the easiest question you could have possibly asked me,” I said. “It’s very simple, and it goes like this: ‘I believe in one God, the Father Almighty, Maker of heaven and earth…'” and I proceeded to recite the entire Creed for her. Keep in mind we only had a forty minute boat ride. I chose to explain, broadly, that we see a continuity, rather than a disconnection, of Christian history over the last 2,000 years, placing ourselves in line with that, and as such believe we are in continuity with the Church of the Apostles. And just today, I saw one of the latest heroes in that history, I thought to myself. “Huh,” she said. It was clear she had never heard anybody talk this way before. I don’t know what they will do with that, if anything; I spent a little bit more time with them after we got off the boat, helping them find a bus stop that would get them back to their hotel. (Boy, I sure hope it did. 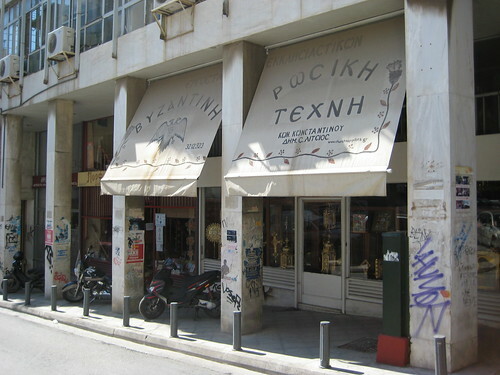 Some of the streets around Piraeus at night are a little sketchy.) They were nice folks, even if it still amazes me that… well, maybe it shouldn’t. People have reported, for years now, that they’ve heard the Saint tapping back, or have heard some kind of music, or the sound of a Bishop’s staff knocking. So, people continue to listen. 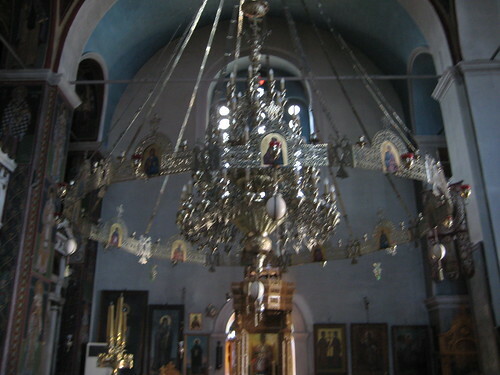 […] This tradition only happens with Saint Nektarios, the people listening. It doesn’t happen anywhere else. So, there you have it. Next time I’ll be preapred. I have no words. Just click and watch it. There are a lot of motorcycles, scooters, and mopeds here. It makes sense, I suppose; my guess is that they’re more fuel efficient, and the way the rules of the road work here (to use several terms very loosely), the divider lines on the roads actually function as motorcycle lanes, allowing them to not have to be stuck in traffic as much. Well, today on the bus home from the Ethniki Amyna metro station, we passed a car wreck. A hatchback of some variety was straddling two lanes, the bumper had the heck dented out of it and was sitting on the ground, and the rear window of the hatch was smashed. Immediately at the back wheels of the car was a motorcycle. It was very evident what had happened; the car was changing lanes as the motorcycle was coming up along the lane divider line. I will note again that the window was smashed. As in, to bits and pieces. Unforunately, given the various heights involved, I can only think of one thing likely to have been responsible for the impact, and I really hope the motorcycle rider was wearing a helmet. Nope. Driving here, at least within Athens, isn’t something I have any desire to do. Read this and read the comments. I think the exchange speaks for itself. To echo Fr. Andrew’s comment: Sheesh. 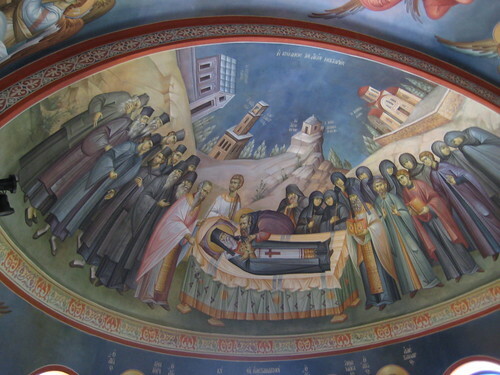 UPDATE: The Society for Orthodox Christian History in the Americas has posted a response to several issues on the comment thread that is worth reading. That centermost white dot is Tom Hanks. Obviously, much has happened in the three weeks or so since I was last able to post a chronicle of my time here. It’s also enough time that certain chapters are closing, or have in fact already closed; I have less than two weeks left here in Greece, my second class at the Athens Centre comes to an end tomorrow, Flesh of My Flesh arrives Monday afternoon, at which point my residence will shift for a few days, my IU colleagues have headed back to the States, and Ioannis Arvanitis has gone on vacation until the end of next week, meaning that last Friday’s Byzantine chant lesson was probably my last. When last I was able to post, my first 3-week class at the Athens Centre was over and the new one had not yet started. This has been a good class, and it has certainly been more of an immersive language learning environment than the first managed to be. There are only two others in the class — Jim, a schoolteacher from Vancouver, B. C. who married a Greek woman and who is hoping to raise bilingual kids (if not just move here altogether), and Jan, the ambassador to Greece from Slovakia. We’ve jelled well. The good thing is that we all have our strengths and weaknesses, but they tend to complement each other. Jan is an experienced language learner, but speaks Greek with a thick Slovak accent. Jim has never learned a foreign language before, and as a result grammatical concepts take him some time, but he absorbs vocabulary very quickly, and his listening comprehension is vastly aided by having had Greek in-laws for the last decade. For me, grammar and reading comprehension are things which come quickly, but vocabulary takes me a bit longer than I’d like, and while my listening comprehension is vastly improved from where it was, I’m still sometimes painfully aware of how slow my ear is. With our forces combined, we’ve nonetheless been able to speak predominantly Greek in the class — let’s say between 80-90% on average, but often getting closer to 95%. 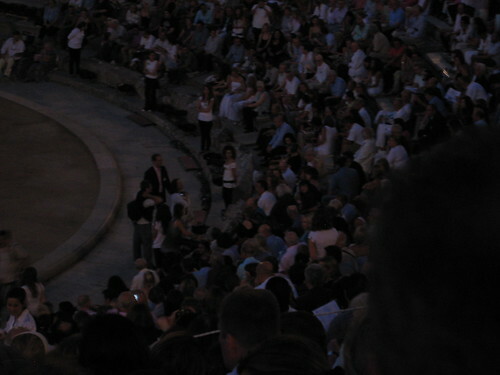 A couple of weeks ago, I went with Frank (my Greek teacher at IU), his wife, and my fellow student Stefanos to see Phaedra with Helen Mirren at the ancient theatre of Epidauros. It was a really wonderful day all around; we first went swimming at a beach in Loutraki, a seaside town on the Peleponnesian peninsula — and let me say, swimming in the Gulf of Corinth ain’t bad. I think that’s the first time in probably eight years I’ve been in a body of water of any size, or salt water for that. 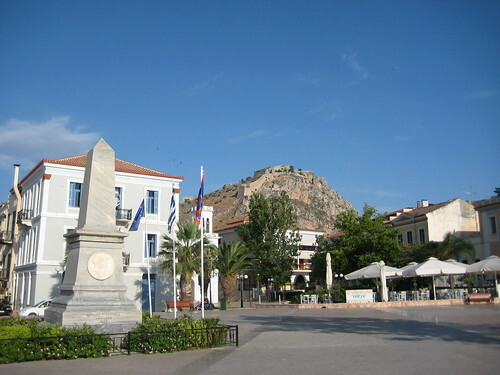 Following the swim, we drove to the port town, and former Greek capital, of Nafplion. We ate a late lunch at a taverna called Vasillis (hey! That’s “Richard” translated into Greek! Perfect! ), walked around the square, and also drove up to Palamidi, the Byzantine/Venetian/Ottoman mountaintop fortress which overlooks the city (“Real cities have medieval castles”). By that point, it was time to head up to the theatre. After being seated (by the way, bring something soft to sit on — the stone risers are pretty much exactly as they were carved 2500 years ago), I heard an American couple talking behind me — “Seen Tom Hanks yet?” I wasn’t sure if they were joking, but I kept an eye on the entrances, just in case. Sure enough, he and his wife showed up and were seated in the center of the front row. That picture at the top of this post was the best I could do, with distance, light, and camera all combined. The play was good; it was a bit weird, seeing a French Baroque playwright’s adaptation of Euripides, translated into English by a modern author, with Modern Greek supertitles, but there we are. It was very nearly a bare stage, with only a few chairs, some sort of small circular platform in the center, and a shell around the back of the stage with ramps leading off and on. Dress was modern, with Hippolytus pacing around the stage in a wifebeater in the first scene. Stanley Townsend was a larger-than-life, aged Theseus; for all of you IU kids reading along at home, think Tim Noble. Helen Mirren, naturally, owned the stage every second she was on it, and was downright creepy for much of the evening. I tend to think that her death scene didn’t have a ton of impact, but that seemed to be a bit of awkward staging more than anything. 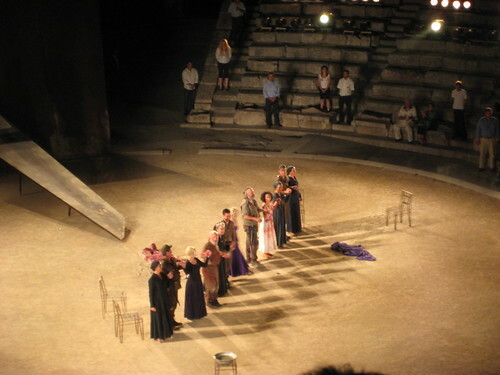 I will also note that the acoustics at Epidauros are everything people claim them to be; it takes the ear a second to adjust, but once it does, you hear every word without any difficulty whatsoever. 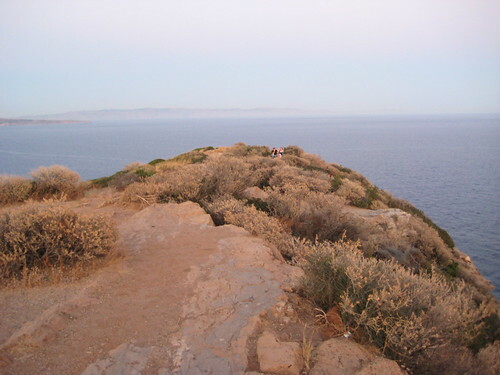 The very next day, Giorgos took me for a drive along the coastline to Sounio — in myth, the place where Aegeus threw himself into the sea, and where there is a temple to Poseidon which is said to form an equilateral triangle with the Parthenon and the Temple of Aphaia on the island of Aegina. The point where Aegeus is said to jumped is very rocky and uneven with a lot of loose stones; to be honest, if there was an Aegeus, I find it more likely that he just tripped and fell, black sails or no black sails. I was wearing Birkenstocks instead of my Merrells — bad idea. On Sunday, at Divine Liturgy at St. Irene, I saw somebody else in the Communion line who looked remarkably like St. Vladimir Seminary faculty member Dr. Peter Bouteneff. As it turns out, it was, in fact, Dr. Bouteneff, explaining why it looked so much like him. 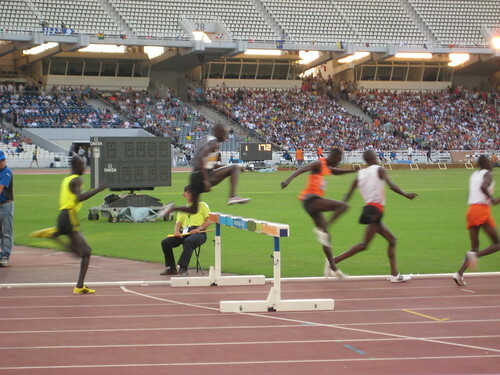 The following Monday, I went to an event called the Athens Grand Prix Tsiklitiria, a big international track and field competition. 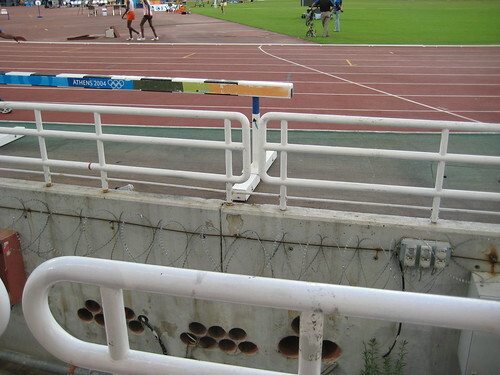 It was a chance to see the 2004 Olympic Stadium in action; I got to see the men’s steeplechase, some of the men’s javelin, men’s high jump, and some of the women’s sprinting events. One very interesting thing is the pit of razor wir e between the seats and the field; they are evidently are various serious about not wanting fans to rush the pitch — not surprising, since it’s also used for soccer. Throughout the week, I did some gift shopping; I discovered that there are a couple of city blocks right off of Annunciation Cathedral where there is nothing but ecclesiastical supply shops. I spent some time browsing through these establishments; as with Apostoliki Diakonia, the answer to just about any question beginning with “Do you have…” is “Yes, what kind are you looking for?” It’s quite something to see such places with your own eyes when you’re accustomed to there being only one or two places in the United States which carry these things at all, and then they usually have to import them. I will be going back for a few gifts; there is a bookstore (which I decline to name) which will not be among the places to which I return, however. Wh en I walked in to browse, somebody was immediately following me, asked if they could help me, and when I said I was just looking, they didn’t leave me alone. It was clear they didn’t want me in there (and I’m not altogether certain why), so I won’t burden them again. By the way: a useful phrase in Greek is, “Μήπως μπορείτε να μου κάνετε μία καλύτερα τιμή;” (Mipos boreite na mou kanete mia kalitera timi? 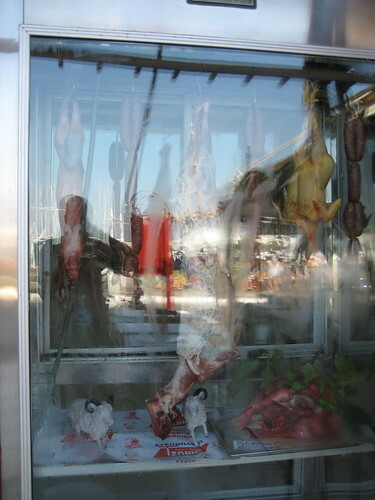 ), which means, “Maybe you can give me a better price?” People will haggle, so don’t be afraid to ask. Also — engraving is quite inexpensive here. I had bought a brass cigarette lighter as a gift, and I wanted to have the person’s name on it. There is an engraver at 9 Havriou Street who does beautiful work; it took less than an hour and cost all of 5 Euros. 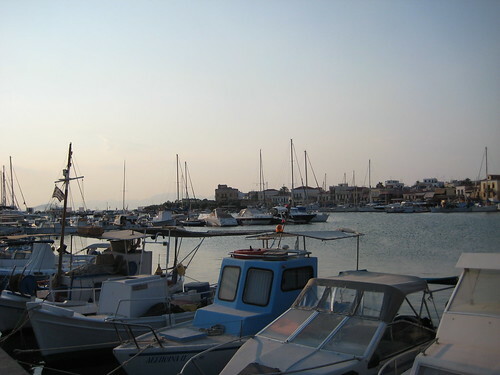 This last Saturday I went to the island of Aegina — this will be its own post. Sunday, I met Joshua Robinson, the Byzantine Greek student I was supposed to go to Petraki with a couple of nights ago. We had e-mailed a bit the week previous, and he met me at St. Irene. He joined Arvanitis and me for what has become our customary coffee after Liturgy, after which we went to Thanassis for lunch and traded stories. Very sharp and nice guy, and it’s good to know that he’s only a short drive north once I’m home — I hope to get to know him better on the other side of the ocean. Anyway, I was inspired enough to seek out a copy of the play, and I found one easily enough. It seems a worthy exercise for the person taking old and new Greek seriously to try to read some of it — we’ll see how it goes. My chant lessons have been extraordinarily valuable; Arvanitis told me this last Sunday that we’ve worked through in a month and a half what he usually takes a year to teach. I am going back to the States with a decent grasp of the basics, close to twenty hours of lesson recordings for reference, and some books of repertoire that are difficult to get on that side of the water. We’ll see what I’m able to do with all of it once I’m home — I definitely have some ideas. Okay — on the whole, this catches us up in terms of the travel narrative, save for Aegina, which will come later. Other thoughts and reflections to come. Less than two weeks. Sheesh. Where does the time go?